In today’s culture it has become normal for human beings to be expected…nay, required to pay a tip to restaurant servers in addition to the cost of the meal regardless of their performance in executing their services. 1. A gift of money, over and above payment due for service, as to a waiter or bellhop; tip. 2. Something given without claim or demand. Isn’t it interesting to know that when “gratuity” is added to the check because of the size of your group, it immediately ceases to be gratuity? Rather it becomes a “you require a larger table” tax, but restaurants misuse the former because it sounds nicer. From a customer’s stand point they are bringing business to the eatery by inviting their friends who will no doubt all buy something…yet, rather than a group discount we receive an overpopulation tax by being required to pay a predetermined tip regardless of the quality of service. Now, what merits a legitimate tip then? If a server is polite, doesn’t interrupt, keeps everyone’s glasses full, keeps the all-you-can-eat dishes coming, brings the food quickly, as ordered and hot, always gives correct change, doesn’t ramble on about nobody knows what….then he or she is likely deserving of a tip. Remember, tips are over and above and are a means of rewarding hard work – if a server does a good job, you should tip them…but only then. If the service is bad and they are tipped anyway, what motivation do they have to do better next time? It’s like every aspect of our society’s tipping philosophy is about rewarding mediocrity and getting free hand outs without earning them. This not only destroys people’s drive to excel but also creates a dependence on hand-outs. So, what if it’s not the server’s fault such as when a cook is being slow or not thorough? I see the two as one in the same. The server still represents the restaurant and if they are missing out on tips because of the cook, they should take it up with management. If the server gets tipped anyway because “it’s not their fault” then the status quo is maintained and the cook will continue to be slow or un-thorough the next time you come to eat there. I hear this argument a lot: “servers can’t make ends meat on the minimum wage that the restaurant pays and they rely on tips for their livelihood.” Obviously restaurants have realized that many people tip regardless of service so they can get away with paying servers as little as possible. The truth is, no one forced you to take the job and no one is forcing you to stay at the job. If you can’t live off what you’re paid get a new job or lower your cost of living. This goes for any realm of employment not just food services. If people would stop tipping for no reason, servers would require more money and the restaurants will have to pay whatever the market will bear. As long as we the customer pay the stupidity tax, restaurants will let us fit the bill. Now what about gratuity amounts? Social standards are to tip 10%-25% of whatever your bill was…What kind of messed up system is that? Using percentages? “Hmm, let’s look at the menu…hamburger $9.95……ribs $19.95….both come on one plate…both require one trip from the kitchen to my table – the server does the exact same amount of work regardless of what I order…yet, if I get the ribs I will pay twice the amount of gratuity than if I get the hamburger…” As you can see from this scenario, using percentages is a ridiculous way to calculate tips. If anything the higher my bill is, the better my discount should be because I am bringing much more business to the restaurant. So what should be done then? 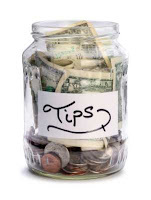 If you ask me, the standard for tips should be determined on a case by case, dollar by dollar basis determined solely by the customer’s overall experience in the subject establishment. From an internal point of view, many restaurants require their servers to pool their tips and divide them equally among the other servers. The thinking behind this was to make it fair for those who may not have gotten a table with as many people or just not as high a tab. Again, here we go with rewarding mediocre service by allowing servers to slack off and let one of their fellow servers make their tips for them. If I do a really great job serving and get a really nice tip, I deserve that tip because I earned it and it shouldn’t be taken from me and given to a server who didn’t do such a great job. In the same way, if I have a great experience and the service is amazing, I want my tip to go to the person who served me and created that experience by going over and above the status quo. Sharing tips is simply practical communism masked in the disguise of fairness. Where does it end? If gratuity is to be expected, then it is no longer gratuity. Will corporations start paying their computer programmers next to nothing and let the software consumers cover the rest of their payroll by tipping? This may sound ridiculous but that’s not to say that it could never happen. If people like you and me are willing to pay “over and above” for services that are “under and below” there’s no telling what else we might pay for. In closing, I am not saying you should never tip…quite the contrary, tip as often as you can. There are many servers who are great at what they do and work hard to earn that reward and I don’t want to take anything away from those people. Give gratuity where gratuity is due and not where it is unwarranted. If you received crappy service, the server should expect to be compensated accordingly and hopefully they will strive to improve should you ever come back to their restaurant.